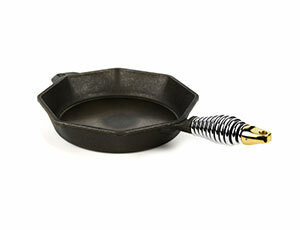 The Finex cast iron skillet is polished smooth for perfect eggs every time. It's a searing machine for hearty steaks, chops and salmon. It's brilliant for baking perfect cornbread, pies, cakes and muffins. 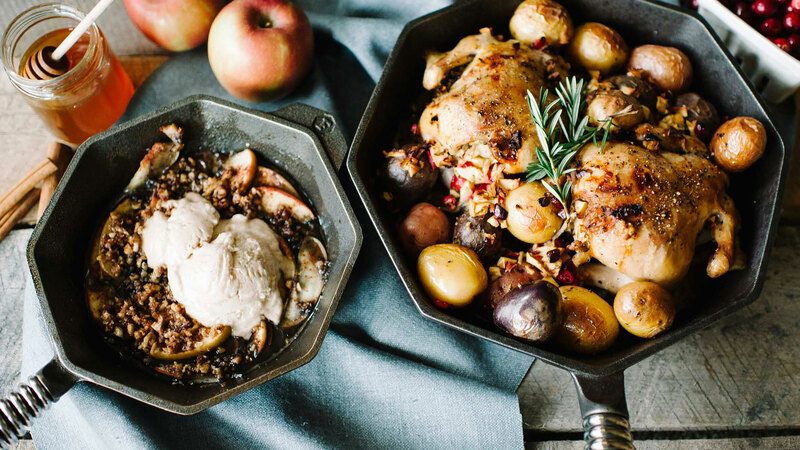 Each cast iron piece is made by hand from premium American cast iron, polished stainless steel and brass and then double hand seasoned with organic flax seed oil for a lifetime of use. The lid is great for steaming, braising and simmering. 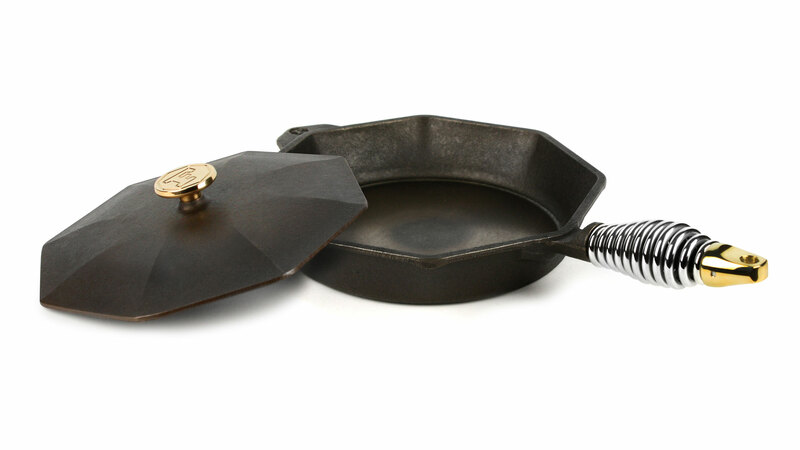 From stovetop, to oven, to grill, even over the coals, the Finex cast iron skillet is a trusted essential you'll pass down for generations. 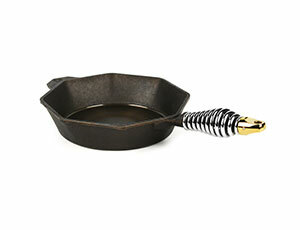 The Finex cast iron skillet is polished for an ultra-smooth cooking surface that minimizes sticking and cleaning. Designed with a distinct geometric shape for easier pouring, means fewer spills and drips. The ergonomic stainless steel spring handle stays cool longer, and cools down faster. The ribbed helper handle on the front lip makes it easy to lift and transfer from stovetop to table. The finishing touch is a beautiful brass cap that makes it easy to hang. 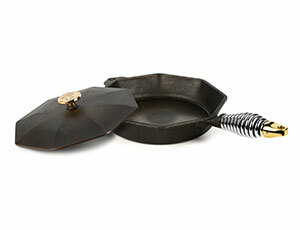 At-home and professional chefs alike love cast iron for its superior heat retention. 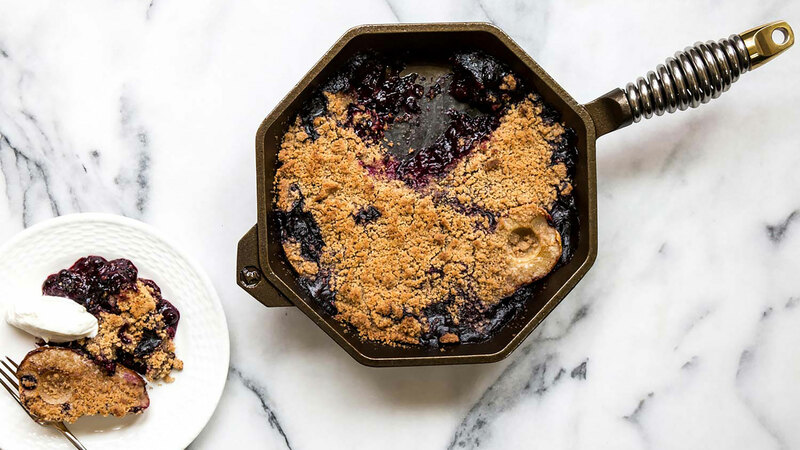 The Finex cast iron skillet's generous size makes it perfect for searing big steaks, thick chops and substantial salmon fillets, while the skillet's extra deep walls contain hearty portions. 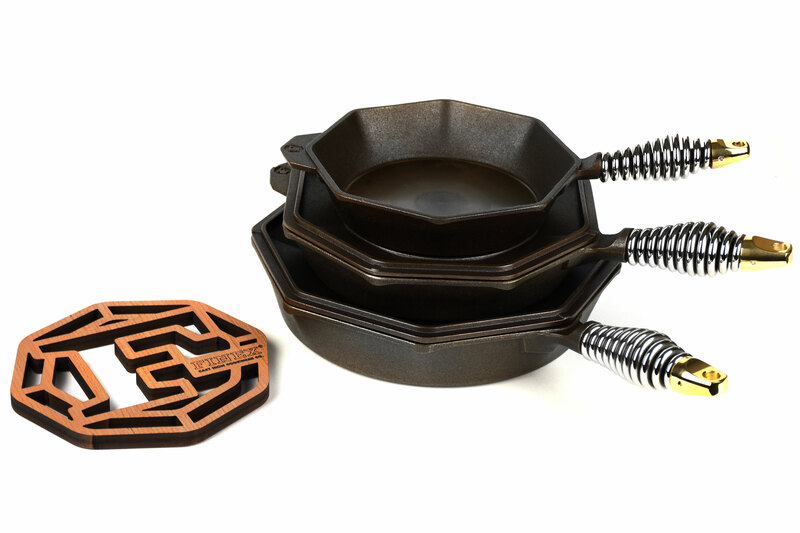 The thick base heats evenly and prevents hot spots, allowing the cast iron to retain heat even when cold ingredients are added. Its brilliant heat retention bakes perfect cornbread, cakes and muffins. 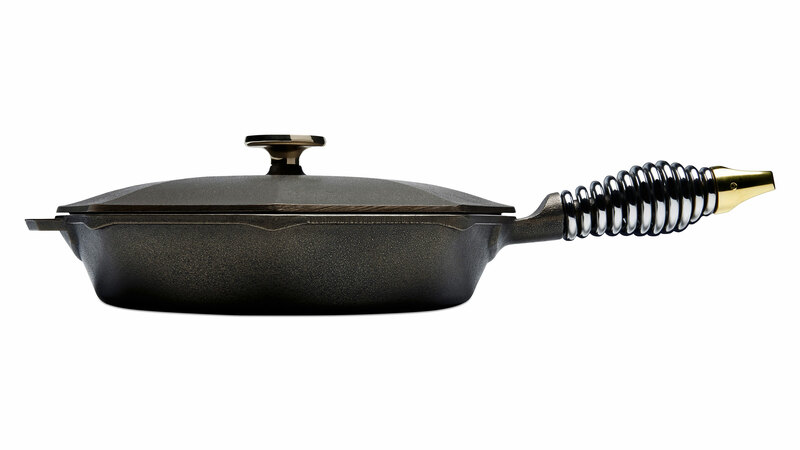 https://www.cutleryandmore.com/finex/cast-iron-skillet-set-p138366 38366 Finex Cast Iron Skillets https://cdn.cutleryandmore.com/products/large/38366.jpg 549.9500 USD InStock /Cookware/Fry Pans & Skillets The Finex cast iron skillet is polished smooth for perfect eggs every time. It's a searing machine for hearty steaks, chops and salmon. It's brilliant for baking perfect cornbread, pies, cakes and muffins. 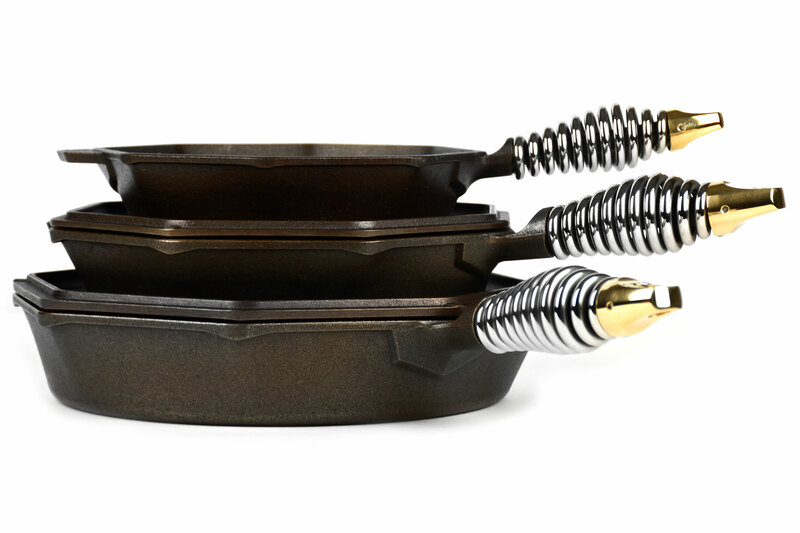 Each cast iron piece is made by hand from premium American cast iron, polished stainless steel and brass and then double hand seasoned with organic flax seed oil for a lifetime of use. The lid is great for steaming, braising and simmering. 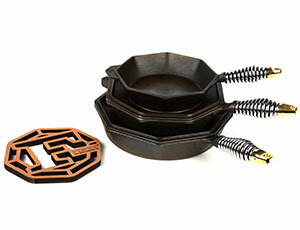 From stovetop, to oven, to grill, even over the coals, the Finex cast iron skillet is a trusted essential you'll pass down for generations. 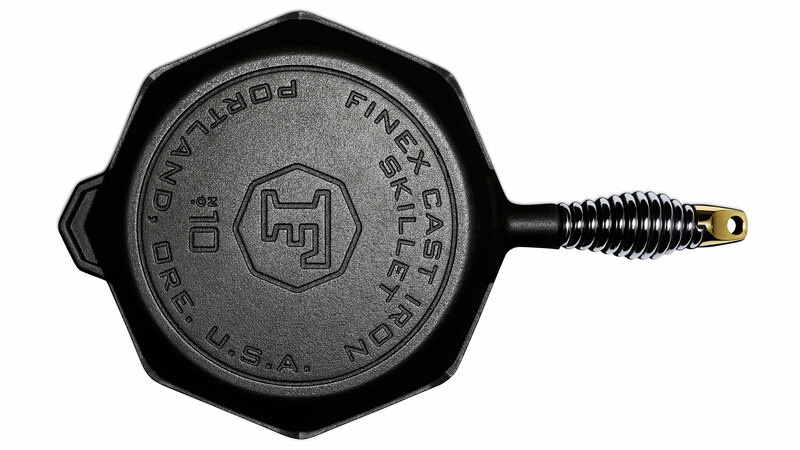 The Finex cast iron skillet is polished for an ultra-smooth cooking surface that minimizes sticking and cleaning. Designed with a distinct geometric shape for easier pouring, means fewer spills and drips. The ergonomic stainless steel spring handle stays cool longer, and cools down faster. The ribbed helper handle on the front lip makes it easy to lift and transfer from stovetop to table. The finishing touch is a beautiful brass cap that makes it easy to hang. 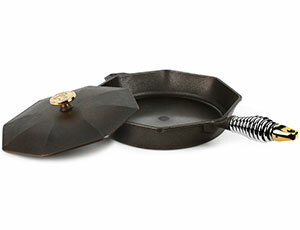 At-home and professional chefs alike love cast iron for its superior heat retention. 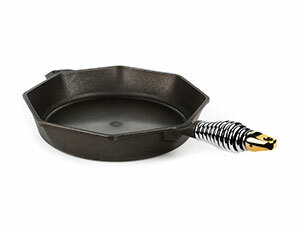 The Finex cast iron skillet's generous size makes it perfect for searing big steaks, thick chops and substantial salmon fillets, while the skillet's extra deep walls contain hearty portions. The thick base heats evenly and prevents hot spots, allowing the cast iron to retain heat even when cold ingredients are added. Its brilliant heat retention bakes perfect cornbread, cakes and muffins.